Prepare to be amazed by the elegant and attention-demanding presence of this gold fumed double chamber glass bubbler. 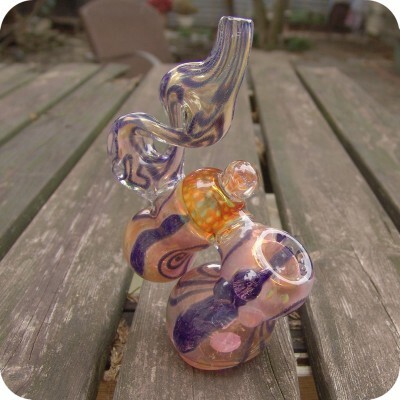 Weighing in at 300 grams, this handblown, inside out, heady piece displays the finest of glasswork techniques. Complete with two chambers for water for twice the filtration of the average glass bubbler, a large honeycomb adorning the top of the second water chamber, and dichroic stripes that twist around the entire body. Let’s talk about filtering your smoke: two water chambers are always better than one. If you think this piece is stunning right now, imagine it after the color change! Gold fuming yields colors like purple and topaz. 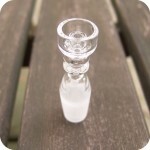 Tags: Brooklyn, brooklyn glass, brooklyn smoke shop, bubbler, bushwick, bushwick head shop, bushwick smoke shop, double chamber, double chamber bubbler, glass, glass bubbler, glass pipe, glass shop, glass water pipe, gold fumed, handheld water pipe, heady glass, new york, new york city, new york city headshop, new york city smoke shop, pipe, pipes, sunflower, Sunflower Glass Co, Sunflower Glass Company, sunflower pipes, water pipe, williamsburg, williamsburg head shop, williamsburg smoke shop.